Bracelet with traditional motifs. Your outfit’s ready, your hair is perfect, your handbag is packed – but before you head out to the party, you still need to find the right accessory! This beautiful bracelet by Schuhmacher is always a great choice, as its old-silver-coloured design goes perfectly with most outfits. The bracelet is made from hearts with structured surfaces and edelweiss blossoms in various sizes. At the end of the bracelet, a small chain link helps you adjust the length and size to best fit you. 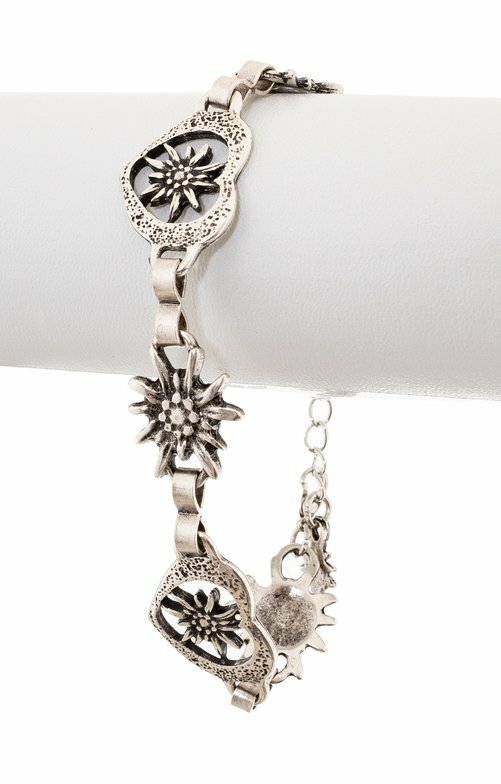 At the end of the chain, a small decorative edelweiss pendant stylishly rounds this accessory off. Ein sehr schönes Armband, auch bei dünnen Armen !